An artist’s rendition of Landsat 5. June 24, 2013 • When the Landsat 5 satellite launched on March 1, 1984, it was expected to last at least three years. More than 29 years and 2.5 million images later, the U.S. Geological Survey issued the final command to the aged satellite on June 5, 2013, andofficially decommissioned it on June 19. The Guinness Book of World Records has recognized Landsat 5 as the longest-operating Earth observation satellite. Landsat 5’s unusual longevity is due to help from its twin sister, the space shuttle program, and creative engineering from mission operators at USGS. Built at the same time and with the same design as Landsat 5, Landsat 4 launched on July 16, 1982. Early in its mission, the satellite began to have problems with its power system. Engineers on the ground identified the problems and fixed them on Landsat 5, which was in storage waiting to be launched. As a result, Landsat 5’s power system did not encounter the same problems. Landsat 5 launched during the ambitious early years of the shuttle program when NASA anticipated flying shuttles in a polar orbit to retrieve aging satellites, repair them or replace defunct instruments, refuel the satellites, and release them back in to orbit. The shuttle repair operation was supposed to maintain satellites at much lower cost than building and launching a new satellite. Landsat 5 was equipped with a large auxiliary fuel tank that would allow it to fly down to the lower shuttle orbit for repairs and updates and then return to its 750-kilometer (438 mile) orbit. However, the polar-orbiting shuttle program never got off the ground, and so the auxiliary fuel was not needed for repairs. Mission operators used the fuel to keep the satellite operating for nearly three decades. Creative engineering was also critical for Landsat 5’s long lifetime. In January 2005, the satellite’s primary solar array drive failed, and months later, in November, the backup drive failed. This key component turned the solar array to face the Sun straight on whenever the satellite was on the sunlit side of the Earth. Without the drive, the solar array was stuck in a single position, limiting the amount of energy it generated to power the instruments and spacecraft. The failure of the drives looked to be a mission-ending event, since the Landsat 5’s batteries couldn’t be recharged sufficiently to continue science operations. But mission operation engineers came up with a novel solution: If the solar array couldn’t move, they would move the entire spacecraft. Before the satellite came across Earth’s shadow into the sunlight, they pitched the satellite to face the Sun. The satellite faced down again to acquire data, and then, approaching the shadow again, pitched out to face the Sun. This dance gave the satellite just enough extra Sun exposure to keep the batteries charged and execute its imaging duties. Landsat 5 had four pathways for sending data to the ground: two communication links with relay satellites, and two direct downlinks to ground stations. The last of these failed in 2012, preventing the satellite from sending data from its primary instrument (the Thematic Mapper) to the ground. The secondary instrument, the Multispectral Scanner (MSS) had been turned off in 1995. Mission operations engineers realized that the communication links used by MSS were still good, and the mission could continue if the MSS still worked. Seventeen years after turning the instrument off, engineers powered it back on, and amazingly, it worked. This allowed Landsat 5 to acquire one more year of data until Landsat 8 was ready to take its place in early 2013. Landsat 5’s final critical failure in November 2012 wound up being a gyroscope used to help keep the satellite from pitching and rolling. 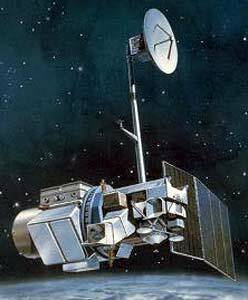 Though Landsat 5 had enough gyroscopes to continue operating, it had no backups. One more failure would have sent the satellite out of control in a very valuable Earth-observation orbit. USGS decided to decommission the satellite, leaving the orbit open for Landsat 8. 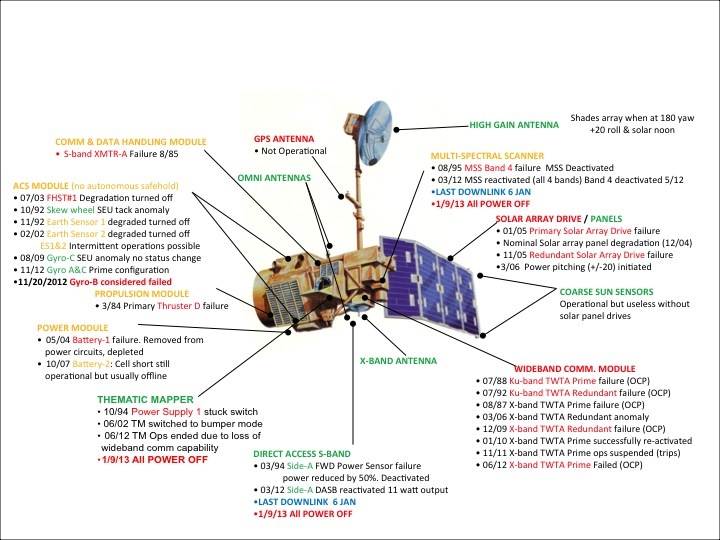 In January 2013, Landsat 5’s instruments were powered off and the satellite was moved in to a lower orbit. Mission operators conducted several burns to use all of the excess fuel, and put the satellite into a disposal orbit in June 2013. They sent the last command to power off the transmitter on June 5, 2013. After a long and successful mission, Landsat 5 will re-enter Earth’s atmosphere in about 21 years. Landsat 8 took Landsat 5’s orbit after launching on February 11, 2013, continuing the Landsat program’s long legacy.